Unfortunately, we have had to cancel my Appalachian Mountain Club Winter Photography Workshop due to low enrollment. This winter has been a tough one for the outdoor industry in New England because it has been so bitter cold. Apparently, people would rather stay indoors when the mercury falls well below zero. However, I am happy to announce that this autumn I will be offering another workshop through the AMC in the White Mountains. 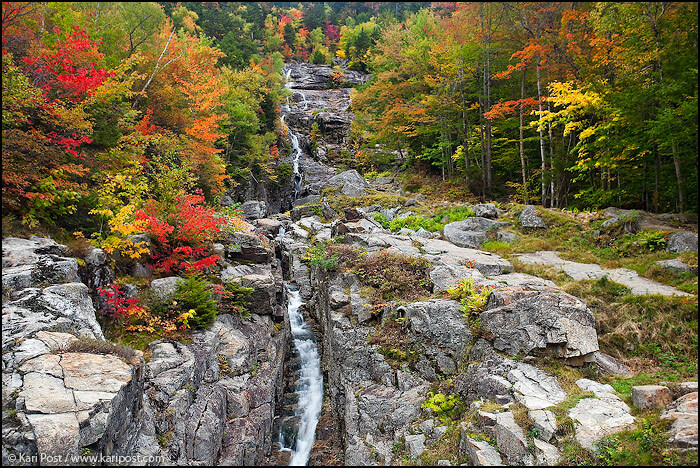 Join me for a fall foliage in the Whites October 3-5th. There are a ton of photo opportunities in the area that are just bursting with color during peak foliage season – the photo below was taken just down the road from the Highland Center, where the workshop will be based. I’m already excited! Autumn maples in fall color line the banks of Silver Cascade in red, orange, and yellow. Posted in Adventure, Education, Photography, Website Updates and News and tagged AMC, Appalachian Mountain Club, autumn, fall color, fall foliage, Highland Center, New Hampshire, peak foliage, photography instruction, photography workshop, White Mountain National Forest, White Mountains, workshop on February 14, 2014 by Kari. I don’t snore. I’m a very quiet sleeper. I don’t toss and turn, and I don’t breathe like a Mack truck. I’m the type of person you want to go camping or road tripping with because as far as sleeping goes, you can give me a sliver of a corner of a bed or sandwich me between others in a tent and not have to worry about me assaulting you in your sleep, physically or audibly. I sleep peacefully, at least on the outside. The only time I snore is when I’m sick and congested, and even then it’s rare. But, after a long and successful weekend of working with the North American Nature Photography Association’s College Program, my student roommate lodged a complaint about me – I snored. I’m not even sure if I believe it, but if it is true, the only excuse can be how exhausted I was. Two years ago, I was a scholarship recipient for the college scholarship program and participated as a student. This time, I was on the flip side, engaging with the program as a committee member and mentor to this year’s crop of talented students. Together with other members of the committee, I spent more than a year planning and preparing for this year’s program in Jacksonville, Florida. I connected with a local land trust to establish a conservation project for the students and flew in a day early to scout the area before the students arrived. Once they got there, I spent most of my time with the students in some capacity, shuttling them around Big Talbot Island for field shoots, sharing meals and staying with them in a house on the island, helping facilitate the creation of their project, joining them for summit events, and doing my best to connect them with other important and inspiring photographers and share what knowledge and experience I had with them. If I wasn’t with the students, I was in the trade show fielding questions and taking orders at the NatureScapes booth. I sure as heck wasn’t resting. The NANPA College Program provides an intense but immensely rewarding experience for the undergraduate and graduate students selected to participate. I know because I was one, and my experience as a NANPA student changed my life. Through the NANPA College Program, I had the opportunity to collaborate with peers on a project that would help contribute to the conservation and protection of wild habitat in the Rio Grande Valley in southern Texas. I had the opportunity to meet and talk to professionals doing the exact work I wanted to be doing. I found people who inspired me and supported me, and I met people my age with similar goals and dreams. I knew from then on that my photography would change, and indeed it has. I didn’t think any experience in my life would have the potential to eclipse that of being a participant in the 2011 NANPA College Program. There was nothing else that I felt would feed my soul in the way that it did, but I was wrong. Being on the flip side is even better. I joined the College Program committee because I wanted to be involved in creating a powerful and life changing experience for others similar to the one I had. Little did I know how much that experience would give back, and how much it too, would sculpt my future. As a program participant, I was inspired by my peers, and as a committee member the students inspire me even more. Selected student applicants are talented. They’re intelligent and creative. They are motivated, enthusiastic, and each one brings a unique perspective and set of skills to the group. They have innovative ideas and endless drive and passion. But the students are only a part of the equation, albeit a huge and wonderful part. This year, a lot of the joy I felt was in working with my fellow committee members and others involved in the college program at the summit. The program would not have been possible without the combined efforts of so many people working together. Working with these people gave me opportunities to make new friends and for us all appreciate one another in new ways. Just like being a part of the college program built friendships with and respect for my peers, being a committee member has exposed me not just to the capabilities of the students, but the efforts and dedication of dozens of others working in various capacities. It was incredible to see the support for the students from professionals like keynote presenter Art Wolfe and companies like Canon USA and Canon Professional Services that provided the program with professional equipment to use. Others, like Hunt’s Photo and Video and Lowepro, donated gear. So many photographers wanted to meet with the students that we had to turn some away because there simply were not enough hours in the day. Through the College Program, I am able to experience the spirit of the people involved in NANPA, and am reminded of what a special organization it is. The students motivate me to better myself as a photographer and inspire me to continue to share my knowledge and passion with others. They encourage me to think in new ways and push me to use my work to create positive change in protecting the environment. As a committee member, the impact the program has had on me is powerful and life changing, just as it was on me as a student. At the summit, people kept telling me I looked tired (which I’m sure is a nice way of saying, “you look like goose turd”). I was tired. But every bit of exhaustion I felt was worth it to be a part of the College Program, to have the opportunity to work side by side with an amazing group of committee members and mentors, and to get to meet and bond with the exceptional group of students at this year’s summit. Being involved with the College Program enriches my experience as a NANPA member, and I wouldn’t trade it for the world. Even if it means I snore. Posted in Education, Photography and tagged College Scholarship Program, NANPA, NANPA committee, NANPA Summit, North American Nature Photography Association, students, volunteering on March 5, 2013 by Kari. For me slowing down is hard. My mind wanders constantly. No matter where I am, I am always wondering, what’s next? What am I going to do with my life? What is my purpose? Fortunately, what was next – after my commencement ceremony, after the potluck picnic in the park where I saw at least a few dozen friends for what will probably be the last time ever, and after my mom and friend Molly returned home to New Jersey and Pennsylvania respectively, and my roommates Mike and Hillary headed to Rhode Island for the summer – was a trip to Baltimore, where one of my best friends, Tzvi, was waiting for me in the airport with a hug. And then followed 10 days in West Virginia, one of my favorite states, with a small group of amazingly bright and inspiring students from Johns Hopkins University. This is the third year I’ve led an outdoor instructor training trip for Hopkins students, and its one of my favorite trips. I was also expecting this one to be my last. Happiness for me is a mountaintop with a scenic view of the valley below. The smell of azaleas and wildflowers on the wind. The red sun bowing below the horizon, bidding farewell to day. More than that, it’s sharing experiences such as these with others. It’s sharing myself with others. It’s being me, all flawed and full of love and hope and with a hamster on a treadmill in my head. Sometimes I just need a reminder. Sometimes I just need a breath of fresh air. No Facebook or internet or email. Just good company. Laughter. Nature. And that feeling of holding on just long enough to fall in love and then let go. And know that even though everything doesn’t feel ok, it is ok.
And it will be ok.
Happiness is a day in the woods. Or a week. 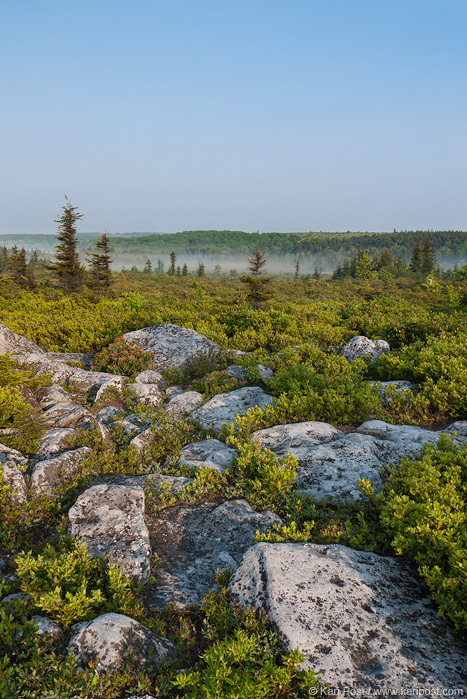 Posted in Adventure, Education and tagged adventure, backpacking, Calvin & Hobbes, Dolly Sods Wilderness Area, Johns Hopkins University, personal reflection, West Virginia on June 8, 2012 June 8, 2012 by Kari.